The world is talking. Is your content talking about the same things? Here are four ways to make sure it is. In the world of online content, the topics people write about are often quite random. The goal of producing interesting and valuable content should be to establish credibility and drive visits to our websites. That can more effectively be accomplished by strategically choosing topics. Aside from obvious topics in our chosen fields, how can we tap into and capitalize on the ever-changing flow of topical web traffic? I mean, how was I supposed to know that Kanye West was a telemarketer? Drivel? Sure, but that’s what people talk about. The key to harnessing what people are talking about is to stay ahead of the trends. Knowing what topics are trending puts us in charge. We know exactly what type of content we should be creating to remain topical and relevant to our audiences. Too often when we think of “trending”, we picture the world talking about Caitlin Jenner or Kim Kardashian. Or Kanye West, for that matter, but don’t tell anybody that I said so. But there is a myriad of other trending topics that have nothing to do with celebrity slip-ups and break-ups – subjects that are actually relevant to your audience, in your field. The tricky part for most writers is finding a relevant subject that’s trending. However, writing within the context of the trends can score a pretty high payoff for reader engagement, so it is worth making the effort. If you consistently touch on highly sought after or hotly debated subjects, the result will be a steady increase in traffic over time, and perhaps some drool-worthy peaks of sudden interest along the way. Aside from the obvious benefit of increased traffic and increased reader engagement, writing on trending topics adds to a writer’s credibility. If you are writing on trending topics, obviously you are in the know. In the olden days, reporters would hang around certain bars and restaurants, keeping their ears open. They would talk to bartenders and barbers. That would give them a pretty sound sense of what folks were talking about. There are faster ways to keep track of what’s trending these days. Here are four of them. Twitter holds a special place among social media, especially for finding what is trending. Due to its very concise and instantaneous nature, Twitter has become the go-to reference for news and commentary around trending topics. Trends on Twitter change in real time, and show up in the bottom left corner of the screen in the “Home” view, or on the bottom right corner of the screen in your profile view. 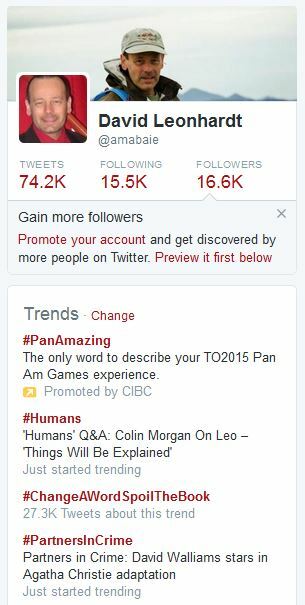 In the picture to the right, we see that one of the trends as I was writing this post was “#Humans”. Let’s take that as a portent of good fortune for our future. Trends can be edited by location, too, to see what is trending in a particular area. By engaging with those trends through simply tweeting or retweeting related tweets, you can gain exposure to a wider audience instantly. Don’t forget to include the trending hashtag in your tweet! Then by following up with a blog post, and tweeting that in turn, you bump up your exposure with that topic and pull in more traffic from Twitter. Although Twitter is the social media platform that offers up the trends, don’t forget that the same planet of #humans is also on FaceBook and Google Plus and elsewhere. And on most platforms, those #humans use hashtags. 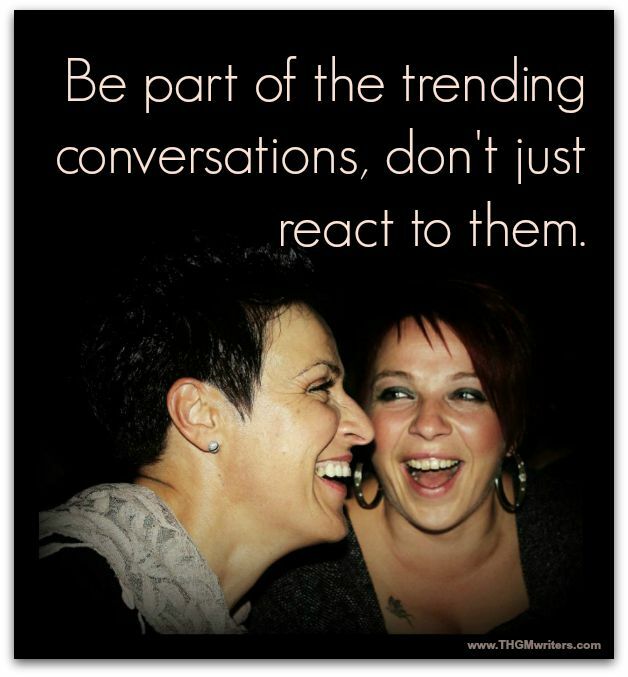 So grab the trends on Twitter, but share your blog posts everywhere. Visual, informative, powerful. 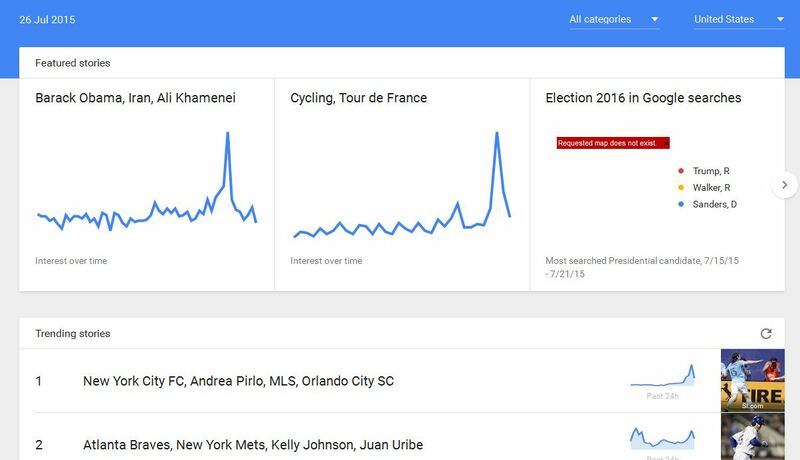 Google Trends is the easiest way to see what people all over the web are searching for. Identifying which topics are on their way up in searches can help content creators like us create exactly what the #humans are searching for, or even to tweak our articles or terminology to be where searchers can most easily find our content. Since so much traffic on the Web comes from search results, getting a day ahead of the trend gives Google and Bing the chance to index our content so that it can show up in relevant search results. The added benefit of consistently writing about what is trending is that the search engines will see your website as more up-to-date, and in certain niches (entertainment, sports, politics, for instance) that can give your website an advantage in the search engines. Sometimes, the world of social media and search moves too fast, and topics can trend only as blips on the radar. Wheee there goes a trend! And…there it goes. I mean, it’s gone. The hard work we put in to creating topical, trending content can miss out completely. ReallyTrending takes credible news sources, like national and international newspapers and highly respected blogs, and finds the topics that the most people are talking about. 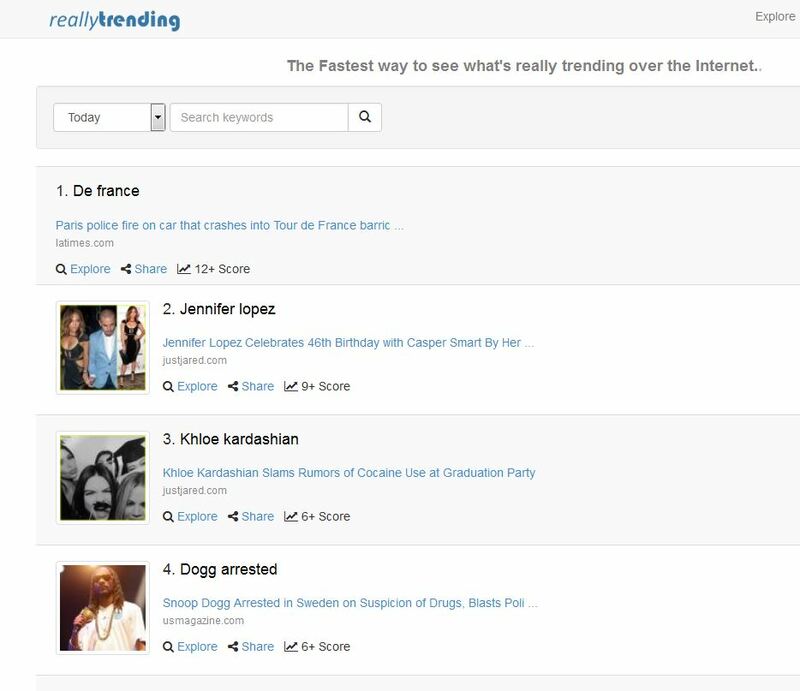 By focusing on the authority of the press, ReallyTrending identifies trending news before the social media conversations take place. That gives writers the chance to create their content as the topics start trending, rather than just react to them. ReallyTrending also offers the ability to search in a specific niche through keywords, which means that even if one is writing for a specific, targeted audience, we can still find what is trending within that topic. In other words, just because Jennifer Lopez is trending across America, doesn’t mean she is trending among real estate agents. Or among home schoolers. Or among welders. Since the site links only to credible sources that get solid traction on social media, we know that the trending topics are backed up by legitimate research and writing, and are likely to ignite conversations on social media. This helps content creators not only to find good topics, but also credible sources to link to. Or if content curation is part of your strategy, it provides topical suggestions to curate for your audiences. As the site is automated, and since news outlets create tons of new content every day, ReallyTrending provides an endless source of new content ideas for writers and curators. If you are more intuitive, or your niche is really narrow, you might prefer to find what’s going on yourself. This can be done by carefully following only select accounts on Twitter or Pinterest or elsewhere. This gives you the opportunity to explore how people are talking about various topics, and to be much more specific if your audience is a very narrow niche or a closed group. Even better, get ahead of the trends. Use the resources listed here to maximize the ROI for your time and effort, and write content that’s not just a reaction to social media conversations, but part of those conversations. Write content that’s part of trending conversations, not just a reaction to those conversations. These are some very helpful tips to find trending content around the world and online. You can see what is trending right now and what are people talking about the most there. It is a very helpful feature from Facebook, I would say. Great topic here for content writers man! … thanks for sharing it! Google trends have changed a lot lately, back in 2007 or around that time – they used to show 100 trending topics in the hottrends list – which is now narrowed down to only 20. I had created a blog on “Cars” back in those days and used the trending topics to create the blog posts. I just made sure that as soon as a trend broke out – I was the first to get a post live on that topic. Loved the traffic it used to get on every single post. I still apply trending topics in my content, perhaps not as much – but it still brings results. Surely, following trends leads to increased control. Although there are relevant and irrelevant trends, businesses must be able to filter out what trend best suits their interest. It good to be reminded of the essence of mining trending content ideas from Twitter and Google, however, my best takeaway here has to do with ReallyTrending. This is my first time of learning of this resource. I hope to explore the features in no time! I left the above comment in kingged.com where this post was upvoted. What an excellent article, I just love the fact that you are encouraging us to be part of the trending Conversations and not just reacting to them. Google trends is an old times favorite of mine, but the results have definitely gotten skimpier. I haven’t really followed Twitter trends. I’ve been involved in forum marketing since before I started my blog, so I’ve been trying to keep an ear to the ground for topics coming on the horizon by listening to small niche groups. Thanks for this thought-provoking article, I’ll be sharing it with friends. Have a great evening. These are some really great resources you have mentioned to help find trends to write about, though these trends will have a lot of competition, so you will have to write an amazing article to really get some exposure and noticed. Though I think what you are saying here great, I also think people can look into what might be trending next , which would be hard to do and take a lot of research and knowledge in your niches. I have never heard of reallytredning and you make a really good point there. Everyone may not be talking about the same thing across different niches. That site allows you to find out more about your niche. Great post with a lot of great tools we can use to find the trending topics we would use for our blogs and to keep our audience interested. The one thing I do is the DIY approach. I actually find great topics through all the blogs I read as well as come up with topics of my own through my experience. Thanks for sharing David! Have a great weekend! MY focus has always been on long form content that can stand the test of time but I’m quite curious about this. A great way to engage with an audience only problem for me is when sleep is trending it’s because people are too busy doing it!